Reef tanks, known as mini reef aquariums, can have just few gallons of water or several hundred! What is a mini reef? A mini reef is an aquarium containing many of the fish, corals and invertebrates that can be found in the ocean's natural coral reefs. In general, reef aquariums are teeming with life. Even the rock that is used is called 'live rock' because of the organisms found on it. Compared to the traditional marine aquarium, a saltwater tank with fish and coral skeletons for decorations, a reef aquarium setup will have corals, anemones, and many other marine invertebrates and living organisms. Mini Reef tanks are comparatively new to the aquarium hobby. People had been experimenting with keeping corals, especially in "natural" systems, since the early 1960's. But it was the 1980's and early 1990's that saw the beginnings of serious efforts to import, keep, and breed reef animals. This mini reef aquarium guide can help you choose the right reef tank and point you to the best reef aquarium setup for you. Many of the coral reef animals available today are propagated in captivity, and can be kept successfully. Most shops that carry marine and reef animals will have captive bred corals and other invertebrates. There are basically three types of aquariums for marine life. Two types, designed primarily for fish, are the traditional fish only, or "FO", marine aquarium and the fish only with live rock, or "FOWLR", marine aquarium. The difference between a saltwater fish tank and a saltwater reef tank can be quite striking. The abundance of life in the reef aquarium provides a visual treat that makes the traditional 'fish only' marine aquariums seem almost sterile in comparison. Filtered water, either reverse osmosis or de-ionized, is a must for the reef aquarium. It is also a good idea for the marine system as well but is not absolutely necessary. Reef aquarium filtration generally includes attempting to controlling nitrates. This can be done either through filtration like protein skimmers and denitrification filters, through the addition of live rock, or through more constant and larger water changes. It is also desirable to limit phosphates by using filtered top-off water and resins. Lighting in a reef aquarium is generally much more intense as it is trying to simulate sunlight in the tropics. The spectrum is also bluer to simulate conditions at lower ocean depths. Many of the corals require light of this intensity and color to grow and flourish. Several chemicals are monitored and adequate levels are maintained in a reef aquarium. These include, calcium, strontium, iodine, carbonate hardness, and trace elements. Strong water currents are often necessary in a reef environment to bring nutrients to many of the 'filter feeding' organisms and to carry away their waste. Mini Reef aquariums are marine tanks designed primarily for corals, anemones, and invertebrates, and then maybe some fish added. Mini reefs can be large or small, ranging from just a gallon or two up to hundreds of gallons of water. Reef aquariums are made up of a variety of components or parts. The primary components are a tank, stand, filtration, and lighting. Other components can include a canopy or tank cover and an extra integrated water holding tank, like a sump or refugium. When choosing a reef aquarium, there are benefits as well as drawbacks to both large and small sized tanks. Large reef tanks are those that are larger than Nano reef aquariums. Most are about 40 gallons (151 L) to 100 gallons (380 L) in size, but they can also be much larger. Large tanks can handle a wider and more complex variety of reef life than their smaller counterparts. Once established, large tanks tend to be more stable and flexible than small tanks. Large tanks lend themselves well to the addition of a refugium, sump, or grow-out tank. These are water holding tanks, integrated with the main tank. They provide a number of benefits from increasing the total water volume of the system to providing a place to grow algae and other organisms. They also offer a protected place to keep small invertebrates and/or fish that are too small, or are reef incompatible. Large aquariums are much more expensive than small tanks, both initially and to maintain. Initially large tanks cost more, and they require bigger and/or more equipment, accessories, and livestock. For maintenance they need regular weekly or bi-weekly water water changes. Replacement quantities of synthetic sea salt, reef supplements, and other additions are based on water volume, and are an ongoing expense. The Nano reef is a term used to describe small mini reefs. Nano reefs have become some of the most popular mini reef aquariums. They typically range in size from 2.5 gallons (9.5 L) up to 30 gallons (114 L), though they can be as large as 40 gallon (151 L) aquariums. Because of their small size, Nano reefs make the reef keeping hobby more accessible to more people. Nano reefs take up less space, are easier to manipulate, and are less expensive both initially and to maintain. Small reefs cost less and require smaller and/or less equipment, accessories, and livestock than large tanks. With their growing popularity, a number of products specifically designed for these tanks are now available. These range from specialized filtration and circulation pumps to compact high intensity lighting. These allow an aquarist to maintain a proper reef environment that many marine organisms can thrive in. Still small reefs are less forgiving than large tanks. The slightest changes in temperature, water chemistry, or other parameters can have a big affect on the system and the animals. Nano reefs require diligent monitoring of water quality and close attention to livestock. It is recommended that you test the water twice a week for ammonia, nitrite, nitrate, pH, salinity, alkalinity, calcium and phosphate levels, and perform water changes weekly. This is a newer term for small mini reef aquariums that are about 10 to 20 gallons in size. The Micro reef tank is a small Nano reef, but larger than the Pico reef. However it is similar to the Pico tanks in its pros and cons. Like the Pico aquarium, the Micro tank very requires a good deal of reef aquarium knowledge and a strict monitoring regiment. The smallest mini reef aquarium is called a Pico tank or Pico reef aquarium. They typically range in size from 2.5 gallons (9.5 L) of water or less, though they can be as large as 4 gallons (15 L). With their small size, a Pico aquarium with a bit of live rock makes a wonderful showcase for a few hardy corals, and maybe some small invertebrates like shrimps or crabs. Pico reefs (and Micro reefs) take up very little space, are easy to manipulate, and are the least expensive reef both initially and to maintain. Pico tanks (and Micro tanks) reefs cost less with smaller and/or less equipment, accessories, and livestock than the larger Nano tanks. These small tanks have also been growing in popularity. Products specifically designed for these tanks range from specialized filtration, circulation pumps, and compact high intensity lighting to help maintain a proper reef environment for marine organisms to thrive in. You must exercise care when stocking these small aquariums. Coral compete for space and territory both chemically and physically. Animals must be hardy, compatible, and too many can easily overload the system. These small reefs are the least forgiving of the reef systems because of their small water volume. The slightest changes in temperature, water chemistry, or other parameters can have a major affect on both the system and the live animals. Pico reefs require the strictest regiment in monitoring water quality and paying attention to livestock, and there is little room for error. It is recommended that you test the water twice a week, or more, for ammonia, nitrite, nitrate, pH, salinity, alkalinity, calcium and phosphate levels. Perform perform water changes at least weekly, or more often if needed. Both Pico reef aquariums and Micro reef aquariums are more difficult to take care of and monitor than other larger mini reefs. They are best suited to a advanced aquarists experienced with water parameters, their effects, and how to correct them. The temperature in a reef system must be maintained in a range from about 72 to 80 degrees Fahrenheit. Usually this means 76-78 degrees with minor daily and seasonal fluctuations. The water temperature in the tropics is fairly stable so you should mimic this as much as possible. If the temperature creeps up in the summer you may consider buying a 'chiller' to keep it cool. Other ways of cooling it are to open the top of the aquarium to encourage evaporation and use a small fan inside the hood to remove heat from the lamps. With the extra evaporation, make sure and replace the lost water with fresh filtered water on a regular basis. Almost all aquariums will require a heater to maintain temperature in the winter. Buy a good thermostatically controlled heater with output capacity of about 1 to 3 watts per gallon for your reef. Water movement is important in a reef environment for several reasons. Many of the corals and anemones are filter feeders, which means they get some or all of their nutrients from the water column. Currents also carry away wastes produced by these animals. Detritus should not be allowed to accumulate on the rock and substrate, another good reason for water currents. There are many different ways of simulating the water movement in an ocean environment. Some of the more interesting simulate the "surge" of water in a natural environment by pumping water to an overhead storage tank and then periodically "dumping" it back into the tank. Powerheads can also be put on timers so that varying currents can be achieved. At the very least you should have at least one good (400 gal/hr) powerhead in aquariums less than 60 gallons, and two or more in 60 gallon or larger tanks. A general rule of thumb is to provide 5 watts per gallon of aquarium water of either fluorescent or metal halide lighting. This is adequate for corals that need high light intensity and is more than enough for those that don't. The number "10,000K" refers to the temperature color equivalent. For example, 10,000K (10,000 degrees Kelvin) means the color output of the bulb is equivalent to a 10,000 degree sun (actually a 10,000 degree blackbody). When only 5500K metal halide bulbs were available, actinic (blue) fluorescent bulbs were often used as a supplement. Since water filters out red light, as you go deeper into the ocean the light gets bluer and so higher temperature bulbs simulate deeper ocean depths. If you decide to use metal halide bulbs, the higher degree bulbs are better for the control of undesirable algae and the promotion of coral growth. 10,000K and even 20,000K bulbs are now available. Metal halides concentrate heat in a smaller area, so if temperature is a problem, and you don't want to buy a chiller, VHO might be a better choice. VHO fluorescent bulbs put out almost 3 times as much light (110 watts for a 4 foot bulb) as conventional fluorescent bulbs. Common VHO bulb colors are full spectrum (sunlight), actinic (blue), and half actinic, half full spectrum. It is generally recommended to use 1/2 to 3/4 actinic to full spectrum bulbs. Recently, the percentage of blue to full spectrum bulbs recommended has been going up. The bulbs will tend to turn red as they are used anyway, so it may be a good idea to go a little heavy on the blue when they are new. Compact Fluorescent lighting has becoming more and more popular for smaller aquariums as the temperature and wattage choices increase. Beware there are two pin configurations for the fixtures and the bulbs. LED lighting has recently become a very popular solution to high intensity lighting. They are very low in power consumption compared to any other comparable system. As of now (2011) they are rather expensive. All aquariums perform at there best with good filtration, and for a mini reef optimal filtration is absolutely essential. There have been many advances in filtration knowledge and understanding, but primarily there are three basic types of filtration; mechanical filtration, chemical filtration, and biological filtration. Before attempting a reef tank, understanding how each of filtration method work is necessary. The three types of filtration are discussed in detail in the Marine Aquarium Basics guide, see: Marine Aquarium Basics: Filtration. Mini reef tanks need even more stringent filtration than traditional marine aquariums. Reef filtration methods and systems are discussed here. It should be noted that for all of these systems it is beneficial to use "live sand" to introduce the bacteria, worms, and other filtering organisms found in natural ocean systems. Almost every reef setup is characterized by the use of live rock and live sand as the main biological filtration method. At least 2 inches of live sand should be used, especially if it is used exclusively for the biological filter. Live rock at 1.5 to 2.0 lbs. per gallon of water is usually recommended. Live rock is collected directly from reefs and consists of the coral skeletons of "reef rubble" or is cultured from aged rock placed in "farms" near existing coral reef habitats. Live rock gives the added bonus of having de-nitrifying bacteria deep inside the rock to help remove nitrates. Live sand is collected from coral reef bottoms and carries many of the beneficial organisms that live in the reef substrate. Occasionally you may pick up an undesirable species, but the benefit far outweighs any disadvantage when it comes to using live rock and live sand. At least 2 inches of live sand should be used, especially if it is used exclusively for the biological filter. Live rock at 1.5 to 2.0 lbs. per gallon of water is usually recommended. The first efforts at reef keeping involved using the trickle filter for biological filtration along with many high-tech add-on items to control almost every aspect of the water chemistry. Many different additives are used. The complexities of these systems are vast. The references cited below have many reef aquarium books for further study to the interested reader. See reference #11 by Albert J. Theil and #12 by John H. Tullock for good volumes to read concerning the 'high tech' approach. Martin Moe's excellent reef aquarium books, reference #7 and # 13, also go into some details about these approaches. Given the high complexity (not to mention cost!) of the conventional approach, several more natural and less expensive approaches have been tried with success. The Berlin method in general relies on live rock for biological filtration and some denitrification, and a large foam fractionator, or protein skimmer, for nitrate control. The protein skimmer will also remove many of the 'beneficial' elements. You will need to make regular additions of strontium, iodine and trace elements in a Berlin method reef. There are no commonly available tests for iodine and trace elements, so the health of the animals must be used to monitor them. The 'algal turf' method came about through the idea that plants and algae effectively remove nutrients, especially nitrate, and can be grown in a filter area separate from the aquarium. This is a natural approach to water maintenance using processes found in nature and works well in maintaining water quality. This type of system demands an external sump and/or filter area, so pumps are necessary. Using a "refugium" has become popular, which encourages the growth of plants in a separate tank in the same system as the reef display. Bright lights are usually used 24 hours per day in the filter area (refugium) to stimulate algae growth. The algae is then harvested regularly to remove the nutrients that they assimilate to grow. According to Julian Sprung and J. Charles Delbeek in their reef aquarium book, The Reef Aquarium - Volume One , algal turf methods may encourage the growth of algae in the main tank area just by the fact of there being a lot of algae in the system. Dr. Jaubert's method is even more 'natural' than the Berlin method since it doesn't use a protein skimmer but instead relies on a deep plenum in the substrate with low oxygen levels to carry out the de-nitrification process. What happens with this method is that water in the lower levels becomes been depleted of oxygen. So the de-nitrification along with bacterial reduction of other dissolved organics takes place there. to implement the Jaubert method place a grid 1 inch above the bottom of the aquarium with a 1 mm mesh screen on top. Above this place 2 inches of coarse calcareous gravel, followed by another screen and two more inches of sand on top of that. Pile live rock in walls rather than pyramids to leave as much of the bottom sand exposed as possible to perform the water filtration. Unlike the Berlin method, this process will not deplete trace elements. So additions of trace elements is reduced or removed. It was stated that Dr. Jaubert did 5% water changes per month on his systems. The Jaubert method is described in detail in the Fall 1993 and Summer 1994 issues of Aquarium Systems publication of SeaScope. Choosing corals, invertebrates, and fish for the aquarium is the fun part of reef keeping. It is also the most critical for survival of your pets! The best general advice is to make sure the animals you are buying are compatible. Mini Reefs allow you to keep many more corals and invertebrates than typical marine aquariums, yet are more restrictive on which fish you can keep. Be sure you know what your fish eat and what they are compatible with, before buying any fish. For instance, the reef is not a good place for many butterfly fish since they may dine on your corals. Many triggers find crustaceans a handy mid-afternoon snack. Corals can also be chosen for their compatibility. They can also be grouped in different ways as they may be found in nature. For example a shallow water corals do well in bright white light reefs, while deep water corals do well in a less intense, blue light reefs. Another example is a higher nutrient reef can have more leather corals, as they are common in areas where rivers flow into the ocean,. This is compared to a low nutrient reef with more hard coral species that tolerate low nutrient conditions. Many invertebrates are a natural in a reef environment, but some can be quite destructive. Learn about their behaviors and compatibility with your other chosen tank mates before introducing them. Find information on each of the individual corals in our encyclopedia, Coral Reef Animals of The World. Each coral guide includes their foods and feeding, lighting, and compatibility requirements. See the saltwater fish encyclopedia World of Saltwater Aquariums for guides on each marine fish as well. Another great resource for an introduction to the complexities of keeping reef fish and corals together is the reef aquarium book, Conscientious Marine Aquarist, by Robert Fenner. 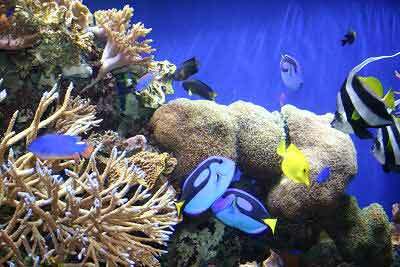 Reef maintenance, care and feeding are more stringent than for any other type of aquarium. Although the different filtration methods require slightly different maintenance, in general there are certain guidelines which can be followed for any reef. Basically maintenance can be broken into into daily, weekly, monthly and twice yearly tasks:. Check for deceased animals and remove them. Notice any leaks or other obvious problems with the aquarium or the plumbing. Also observe the health of the inhabitants and note any sudden changes in coloration or behavior. This can be an early warning sign of impending problems. Also provide top-off water (replace water that has evaporated) if the aquarium is smaller and/or once a week is not often enough due to large water loss. Check all chemical levels and adjust if necessary. These should include: salt, calcium, carbonate hardness, strontium, iodine. Also check for nitrates and phosphates and note any changes. Water changes of 2-5 percent can be done weekly. If you have a protein skimmer, this should be cleaned and serviced. Change any carbon or other resins (nitrate or phosphate removers). If not done weekly, water changes of 5-20 percent can be done monthly. Change light bulbs. If you are using fluorescent, change them gradually one at a time to increase the light intensity slowly over a week or two period. With metal halide, you can raise the lights after changing the bulbs and gradually lower them over the course of the year. A Note of Caution: In our experience additives of any kind can spur the growth of undesirable algae if done to excess. Don't put anything in the tank if you don't know what is in it, and don't exceed the manufacturers' dosage. In general you can get by with a lot less than what is recommended. Of course the best way is to monitor the levels of these elements and only supplement them if necessary. Strontium supplements are required by certain corals, especially the Small Polyped Stony (SPS) corals in the families Acroporidae, Merulinidae, Milleporidae, and Pocilliporidae. Trace elements are another group of chemicals removed by protein skimming. As skimming is becoming more common in all marine aquariums, all of these supplements are becoming more common. Reduce nitrates - by increasing protein skimming. reducing or eliminating feeding, increased frequency of water changes and increased amount of water changed. Nitrate removing resins can also be placed in a filter where aquarium water will flow through the resin. Reduce phosphates - Absolutely use filtered water: either R/O or de-ionized, (but NOT distilled) water for your top off water! Do not use distilled water since it may kill an entire reef. Because distilled water has lost all of its minerals and anything else it might have, the water molecules will bond with the fish/invertebrates that have these minerals that were lost by the water. Put phosphate remover resin in a filter. Reduce or eliminate feeding. Make sure your activated carbon is not leaching phosphate into the aquarium. You can test this by testing the aquarium water for phosphates and then dropping pellets of your activated carbon in the test tube. If it leaves blue trails as it drops to the bottom, it is leaching phosphate and should not be used in the reef! Increase animals that eat algae. Tangs, clownfish, rabbitfish (foxface), some kinds of hermit crabs, like blue spotted red legged hermit crabs (or was that red spotted blue legged?) and many kinds of snails. A coral propagation facility in Idaho http://www.garf.org is a good place to obtain these animals. From personal experience we can say these guys really can do the trick! The brown algae that covers the glass every few days is actually a diatom that requires silicates to live. Therefore if we rid the aquarium of silicates, the brown algae will go away. This is done by using filtered water (R/O, de-ionized, NOT distilled) and by using silicate removing resins. Usually what happens is you will get a brown algae bloom in the first few weeks after fist setting up an aquarium. Sometimes it will cycle through fairly rapidly and then disappear within a few weeks or months. More commonly however, it will reduce itself slowly until it reaches equilibrium where you only have to clean the glass once per week. The red slime 'algae' is actually a cyanobacteria that grows in sheets that will cover portions of the rocks and substrate. Since they live on dissolved organic compounds, the best prevention is a good protein skimmer. Since they are a bacteria, erythromycin will kill it, and is sold as red slime remover, but I would be very careful putting antibiotics in a reef system. In general you are far better off removing the source of the problem, organic compounds, than a quick cure with antibiotics. Another remedy we have seen used with success is to increase the water flow in areas where red slime grows since it will not tolerate water currents!